Tasiujaq was built on the shores of Leaf Lake at the head of Deep Harbour on the Finger River. It lies a few kilometres north of the tree line. Here, the shrub tundra finally gives way to the arctic tundra. Tasiujaq, which means ‘resembling a lake,’ actually refers to the whole of Leaf Basin: Leaf Lake, Leaf Passage and Leaf Bay. Leaf Basin is renowned for its high tides which regularly exceed 15 m.
The region is very rich in marine mammals (seal and beluga), fish (arctic char, Atlantic salmon, trout), ducks (particularly eider ducks) and many seabirds. The region is very rich in marine mammals (seal and beluga), fish (arctic char, Atlantic salmon, trout), ducks (particularly eider ducks) and many seabirds. As well, close to 1000 musk-ox roam the surrounding area. Gyrfalcons and peregrine falcons are commonly found nesting on the islands of Leaf Basin and surrounding cliffs. The French fur company Révillon Frères and the Hudson’s Bay Company each opened trading posts in 1905 and 1907, respectively, on a site located east of today’s settlement. This settlement was along a traditional dogsled route used by Inuit to travel between Kuujjuaq and Kangirsuk. However, both posts had been closed by 1935 without any village ever having developed around them. In the 1950s, when the federal government opened a school in Kuujjuaq and started delivering social services, many Inuit congregated around the emerging village. The wildlife resources of Kuujjuaq however were scarce and many Inuit were forced to rely on government allowances. In 1963, the Northern Quebec directorate of the provincial government, hoping to remedy in part this problem, decided to create a new village on the south shore of Leaf Lake where wildlife resources were more plentiful. In 1966 with the project about to start, the Inuit families which would relocate were divided as to where their future village should be built. A choice had to be made between a site known as Qaamanialuk Paanga and the site of the old trading posts. Qaamanialuk Paanga was finally selected because it was easily accessible by boats used for summer hunting and fishing; nearby Finger River provided the necessary drinking water; and there was room to construct a landing strip. 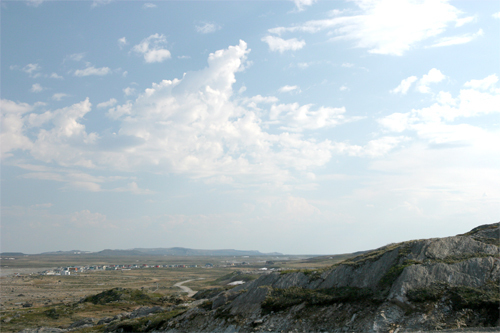 Subsequently, the new village was given the name Tasiujaq. The main reason the old trading post site was not selected as the site for the new village was its foreshore (tide land) was dotted with large boulders, and access by boat in summer would have been difficult. In 1971, once the community was organized, a co-operative store was established independently by residents. It continues to be the only Nunavik co-operative not associated with the Federation of Co-operatives of Northern Quebec. Leaf Basin: exceptional world-record-setting tides. Good hunting and world-class arctic char fishing opportunities.